The Golden Prince of the title is Prince Edward, Prince of Wales and heir to the throne, son of King George V. He is remembered as King Edward VIII, the king who abdicated in order to marry Wallis Simpson. The Golden Prince is concerned with his earlier life however, beginning when he is a teenage naval cadet at Dartmouth. While driving home one weekend, he knocks a young woman off her bicycle, and by escorting her home and meeting her family, changes his life. The events which occur in Edward’s life through the course of the novel are, on the whole, historically accurate. He left his naval training early, was invested as Prince of Wales at Caernarvon, and served aboard the Hindustan. The Houghton family, however, are fictional, although Dean states that she based the story on the prince’s alleged first love affair, with a girl who was not thought to be a suitable future queen, although well-born. The focus is not solely on Edward’s romance. All four of the Houghton girls are narrators, as well as the prince, and occasionally other characters too. Each girl has her own life and concerns, although the presence of the prince in the family’s life is a central part of the individual stories. A key theme to the novel is that of Edward’s unhappiness at having his life arranged for him, and being unable to make any decisions for himself. This is why he wants friends of his own such as the Houghtons, outside the formal and closed world of the royal family. By all accounts this is true to life, as he didn’t have a good relationship with his father and hated the fact that everyone else decided how he was going to live his life. Although the romance in The Golden Prince may be fictional, it serves a purpose in showing the prince’s desire to live his own life. I was uncertain about reading a novel about a recent historical figure, as so much is known of Edward’s life that I thought it might be annoying if it was inaccurate. Reading novels about the Tudors, for example, is a bit different, as there are considerably less records and facts available. However, Dean does a good job of bringing Edward to life. His character in the novel matches what I know of his true character, and because the story is fictional although set over real events, means that the worry of inaccuracy isn’t so strong, because the novel is not attempting to be accurate. On the other hand, I always worry about historical fiction being taken as fact. In Philippa Gregory’s The Constant Princess, for example, Catherine of Aragon is portrayed as having been deeply in love with her first husband, Henry VIII’s brother Arthur, and having consummated her marriage to him. This is something which is simply not known, and which of course became important in Henry’s later reasoning for why he should divorce Catherine (although he no doubt would have found another reason if he couldn’t use that). My concern there was that readers would accept this version as fact. 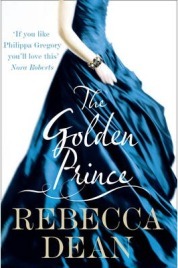 I have gone somewhat off topic when it comes to The Golden Prince, but the same point applies – readers may believe this to be based on truth, and believe that Edward did fall in love with one of the Houghton girls, and everything else which follows in the novel. Saying that though, as long as the reader understands that although based on a real person, The Golden Prince is fiction, then it makes for a very enjoyable read and an interesting insight into Edward. There is also the benefit that whether the reader believes it to be truth or not, it is likely to lead to more factual reading on Edward VIII. As for myself, I found I felt incredibly sad for the young Edward. I don’t approve of the choices he made later in life (although I think it was for the best, as his brother turned out to be a better king than he could ever have been), but at the time that The Golden Prince is set, he is simply a young man who is unable to have close friends or choose his own path in life. This makes him a very sympathetic character, and you wish for a happy ending to the story, although that would be a complete break with historical accuracy. I enjoyed The Golden Prince a lot more than I expected, and as a result I’ve already bought and read Dean’s next novel, Wallis, which hadn’t hugely appealed to me prior to reading The Golden Prince. While some may be reluctant to read historical fiction such as this, I would recommend it – Dean treats her characters with care, and the result is a gripping novel. No Comments on "The Golden Prince"